Why bother? That’s been the conventional wisdom when it comes to investing in animal health. After all, it’s a complex and somewhat closed ecosystem. It’s smaller than the human health markets. It carries a lot of risk, with lots of red flags that come with complicated regulatory environments. And even the big health pharmaceuticals seem to be stepping back from the animal health markets – for example, see Lilly’s planned divestiture of its Elanco stake, Bayer’s Animal Health division sale and the earlier Pfizer and Zoetis actions. In spite of all those challenges, I offer a different perspective, one which I will discuss at the Animal Health Investment USA conference, April 10-11, 2019, in Boston. 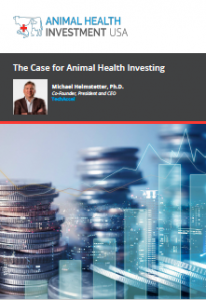 In my perspective, animal health is ripe for new investment, and smart money is applying lessons from other industries to the opportunities in animal vaccines, therapeutics, diagnostics, feeds, sensors and data-related products and services. This is an underfunded market, and that means opportunity. There’s tangible excitement these days precisely because there are so many new startups entering the market, plus a myriad of researchers repurposing innovations from related biological or agricultural fields for use with animals. The tidal wave of investment in agtech is starting to spill over into animal health – and may lead to the same kind of exuberant business disruption. Not all of it works, of course, but modeling the future is never perfect. Here’s my view of five of the most exciting and innovation-rich areas to consider for investment in animal health. Alternatives to antibiotics:The FDA ban on growth antibiotics was a strike against the dangers of antibiotic-resistant infections, but animals and humans still rely on antibiotics for treatment of diseases. The clear and present challenge now is to meet those needs without antibiotics – and fortunately, there is promising work in a number of biotechnologies: probiotics, immunity-enhancing nutrients, bacteriophages and more. Lifting advances from human health care, these technologies frequently find a ready fit in animals. Gene editing technology:You already know the cost of sequencing has dropped dramatically and led to vast libraries of genetic data. You also know the ability to manipulate the genome with new gene editing tools is shaking up biotechnology in precision medicines and agriculture. It’s time for the attention to shift to applications in animal health. Look for early focus in bacteria and microbial environments – digestion, nutrition uptake, disease resistance or immunity-enhancing selections for production animals. Aquaculture:A unique market that’s scarcely been touched by the technologies that are common in other agriculture and animal health sectors. It’s a big market, and only growing with demand for protein. There’s a strong drive to find sustainable models to farm and protect biodiversity; at the same time, the industry desperately needs solutions for oral delivery of vaccines and therapeutics as well as fishmeal replacements. Investors are starting to take the plunge – for example, see Aqua-Spark. Not just for medical / recreational use, and not just for humans. With hemp and CBDs showing up in increasingly in consumer products (beer, soft drinks, energy drinks, for example) for health benefits, can the animal market be far behind? We’ll likely see applications like pain relief for joint inflammation, stress reduction and improved digestion for companion animals and production animals – but with the absence of good research data, think of this as a long game worthy of caution. An Internet of Animals ecosystem. This might be an overly large category, covering microsensors, big data and AI, and leading to applications like personalized nutrition, herd management, and just-in-time therapeutics for animals. It spreads over into the entire chain for food production, safety, packaging and distribution. Beyond production, will we use IoA in the wild – tracking migration, protecting biodiversity, managing resources? The challenges of this trend mirror – and lag – the state of IoT. Take just a moment to consider what might be the next tier, too. Vaccinesto halt zoonotic diseases worldwide. Blockchain applicationsfor transparency and immutable data management in food production and distribution. I haven’t even mentioned the role of the microbiome, development of artificial or alternate proteins, novel delivery systemsfor medicines for animals, or mundane challenges like parasiticides. And don’t forget about our increasing willingness to spend lavishly on pets – estimated at nearly $70 billion a year and rising. 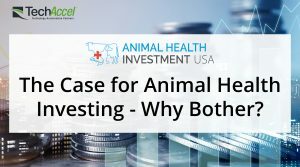 The animal health market is different from human health and other markets, but clearly worth a look. The underfunded nature of the market combined with the rapid-fire technological advances applied here assure innovation and opportunity – for savvy investors. This article is also available as a PDF from Kisaco Research.